"The tendency for liquids to freely migrate within this aquifer (no lateral seals) makes it unsuitable for the disposal of extremely toxic wastes" (Puckette, 1996, p. 158). The recharge area for the Arbuckle Group includes the Arbuckle Mountains of southern Oklahoma (Henry, 1991) and the Ozark Plateau of Arkansas and Missouri. Karst permeability can be very complex and would require detailed site-specific study. 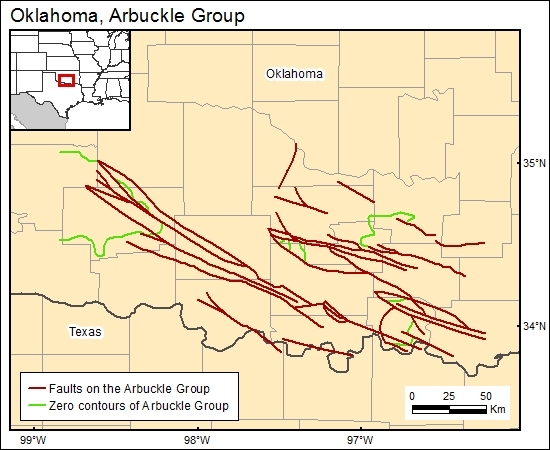 We digitized a map of faults and zero contours on the Arbuckle Group.